Chris Bellew won the Irish Professional Photographers Association Press and PR Photographer of the Year accolade for his snap of Queen Elizabeth looking uncharacteristically meek, peeking from behind a door during her trip to Ireland. The photograph was taken just before the wreath-laying ceremony in the Garden of Remembrance, in Dublin, in May. 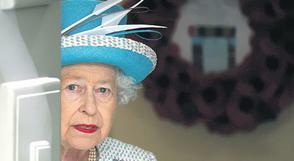 He managed to get a photo of the Queen as she was sneaking around the door and looked directly at him. Bellew has been working for Fennell Photography, in Dublin, for ten years, according to the Irish Independent. Limerick landscape photographer Peter O'Donnell won the coveted IPPA award for his study of an Irish landscape in monochrome.